She began by noting staff changes at NIDA, including the passing of Dr. Toni Shippenberg-Stein, Chief, Integrative Neuroscience Branch. Dr. Volkow remarked that Toni was a friend and colleague, that her passing is a terrible loss for NIDA and the whole field, and that we all will miss her very much. She also reported that Dr. David Shurtleff, former Acting Deputy Director, has left NIDA to become the Deputy Director for the National Center for Complementary and Alternative Medicine (NCCAM). This too is a loss for NIDA as Dr. Shurtleff did incredible work for NIDA, according to Dr. Volkow, and she wishes him well in his new position. A search is on for a permanent NIDA Deputy Director. Other changes include the development of a new translational research office within NIDA, which will be led by Dr. Elena Koustova, the retirement of Dr. Terry Levitin, Director of the Office of Extramural Affairs (a search is underway for her replacement), and the appointment of Dr. Jack Stein to become Director of the Office of Science Policy and Communications. Dr. Volkow next turned to budget issues, noting that the Sequester has resulted in a 5.5% cut of the overall NIH budget, that the budget is in continuing resolution mode, and that the Sequester duration is unknown. She characterized the cut as being “extremely unfortunate”, forcing reductions in noncompeting renewal grant budgets and in numbers of new grant awards. She next described the NIDA research budget allocation, with 44% going to basic science research, 24% to epidemiology, 13% to pharmacotherapies/medical consequences, 8% to intramural, 6% to Research Management and Support, and 5% to the Clinical Trials Network (CTN). She noted that some concerns have been expressed within the research community that the NIDA investment in clinical trials is draining resources from other research areas, but the distribution, which has been stable for some time now, shows that the CTN allocation as a percent of the total budget is not substantial. Next, Dr. Volkow focused on trends in substance abuse, noting that the 2012 Monitoring the Future (MTF) survey of high school students reported that synthetic marijuana abuse is on the increase, climbing to the 4th most widely abused substance, with over 11% of high school students reporting use of these substances. She also noted that hospital treatment admissions as a consequence of prescription opioid use have increased 5-fold in last decade, that overdose deaths have tripled over last 2 decades (amounting to about 100/day in the United States), and that in some states, there are more deaths resulting from opioid overdoses than from automobile accidents. These increased rates of hospitalizations and deaths likely result from increased availability of opioid pain medications, as over 200 million prescriptions were filled last year alone. In response to this epidemic, NIDA will begin soliciting medications development grant applications aiming to lower abuse potential, reduce the likelihood of diversion, and decrease diversion and tolerance development, via the SBIR and STTR programs. Dr. Volkow next discussed recent trends in tobacco and marijuana use, which are in part encouraging (the MTF study reported that tobacco use is down in high school students) and discouraging (marijuana use is up: 22.5% report past month use, 45% of 12th graders report lifetime use, and 6% report regular use). She pointed out that the marijuana statistic is alarming given recent findings on the effects of long-term marijuana abuse on cognition. The prospective study followed over 1,000 people from birth to age 38, during which cognition and marijuana dependence were repeatedly assessed. Subjects initiating marijuana abuse in adolescence exhibited significantly reduced performance on cognitive tasks and reduced Intelligence Quotient (IQ). 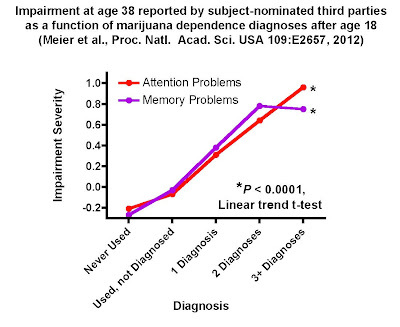 Further, the study reported what appear to be significant real-world consequences of chronic marijuana dependence: subjects with more frequent diagnoses of marijuana dependence between the ages 18-38 were more likely to have worse attention and memory problems, as reported by third-party informants selected by each subject (Figure). 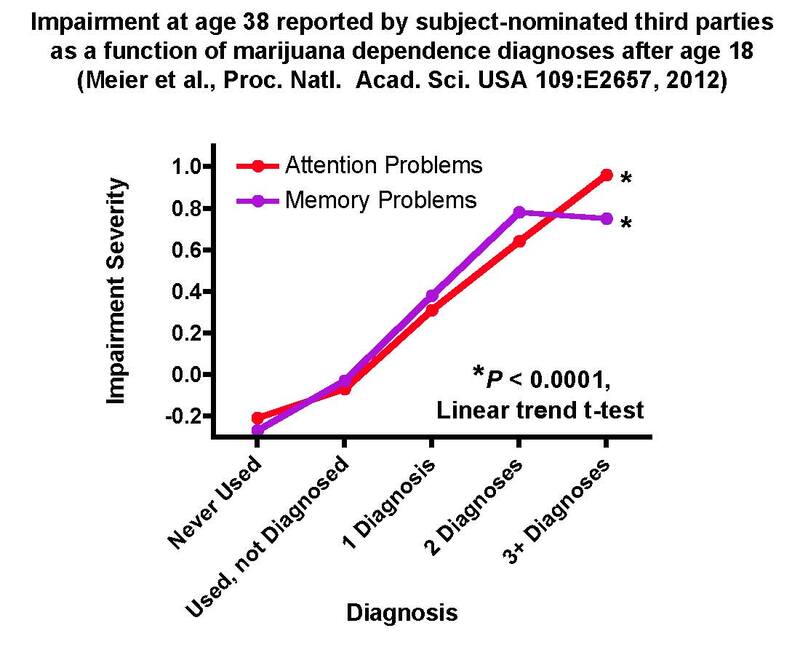 Another alarming finding of the study was that among chronic marijuana users beginning their use in adolescence, cognition did not improve even after subjects reduced their marijuana use, suggesting that some cognitive effects may be irreversible. To begin to address these potential problems, in March, NIDA issued an Administrative Supplement to inform social, behavioral, and public health impacts of recent US marijuana legalization laws/policies. Other initiatives mentioned by Dr. Volkow include NIDA’s support of clinical trials to develop new addiction treatments, an important effort since big Pharma tends to avoid this therapeutic area because of perceived small market sizes, complexities of conducting clinical trials in substance abusing populations, high regulatory hurdles, and the stigma associated with these disorders and their treatments. NIDA-supported trials currently under way to develop new treatments for cocaine dependence include a double-blind placebo-controlled Phase II investigation of a bioengineered cocaine esterase (TV-1380) co-sponsored by NIDA and Teva Pharmaceutical Industries, Ltd., as well as trial of a dopamine beta-hydroxylase inhibitor (nepicastat, Syn117), co-sponsored by NIDA and Biotie Therapies. NIDA also sponsors a program announcement intended to support Strategic Alliances for Medications Development to Treat Substance Use Disorders (PAS-12-122), which offers large annual budgets up to $2 million and rapid timelines (3 years). Next, Dr. Volkow turned her focus to HIV, reporting that we are in a new phase of this epidemic with new infections occurring primarily in minorities and women. Incidence rates now are stable at about 50,000 new cases per year and have not been reduced over time, despite the knowledge that antiretroviral therapy (ART) not only stabilizes those with HIV but reduces HIV transmission rates. She attributed the failure to reduce incidence rates in part to the fact that substance abusers are less likely to be prescribed ART because of stigma and because of the fear that a lack of ART compliance might lead to HIV resistance. She asserted that we must train physicians to get beyond these concerns and make it a priority to seek out and test people who might be affected, treat them with ART, and retain them in treatment to prevent further transmission. Among substance abusers, effective substance abuse treatment improves retention, so physicians must be educated to treat both HIV and any comorbid substance abuse problems. She indicated a need for new treatments to increase compliance among intravenous drug users including longer-lasting medications as well as treatments not based on opioid substitution therapies (which are not permitted in certain countries). Dr. Volkow ended her presentation as she has in prior years by discussing her selection for “Brain of the Year”, a study using neuroimaging biomarkers to identify brain structures and circuits that predict physical pain. She said the study is highly significant because biomarkers are needed to objectively assist in the development of novel pain medications. On Sunday afternoon, Dr. Volkow returned to the podium as part of the CPDD President’s Lecture and discussed plans for Functional Integration of addiction research programs within NIH as well as the new Brain Initiative announced by President Obama and NIH Director Dr. Francis Collins. Dr. Volkow noted that although the Scientific Management Review Board (SMRB) recommended a structural integration of NIDA, the National Institute of Alcohol Abuse and Alcoholism (NIAAA), and parts of other Institutes sponsoring addiction-related research, the Department of Health and Human Services (HHS) recommended against making a structural change. This recommendation was made because HHS ruled that in this time of budgetary constraints, efforts should be invested in managing budgets and developing functional solutions rather than in developing a new administrative structure needed to support a structural merger. She reported that the functional integration will be established with input from stakeholders within NIH, that NIDA, NIAAA, and National Cancer Institute (NCI) Directors will lead the effort, and that Councils for respective Institutes will be involved as well. The funding for functional integration will be supported primarily by NIDA (70%), with NIAAA and NCI contributing roughly 20 and 5%, respectively. Dr. Volkow noted that the next steps in the process include holding a regular series of planning and monitoring meetings, identifying areas of intramural research program integration, and developing a schedule for joint Institute Council meetings, the first of which may take place in February 2014. She reported that part of the initiative includes finding and appointing a permanent NIAAA Director, which will help accelerate functional integration; she expects that an appointment will happen fairly soon. There also are plans to develop a website and to issue Funding Opportunity Announcements for FY 2014. Dr. Volkow next discussed the new Brain Initiative announced earlier this year by President Obama. The initiative seeks to develop a dynamic picture of the brain in action, with the hope that it will catalyze integrative research and be transformative. The President characterized the Brain Initiative as the “Next great American project”. The initiative is being sponsored by the Defense Advanced Research Projects Agency, NIH, the National Science Foundation, the Allen Institute for Brain Science, the Howard Hughes Medical Institute, the Kavli Foundation, and the Salk Institute for Biological Studies. While NIH will contribute $40 million to the initiative, Dr. Volkow noted that this is less than 1% of the overall NIH budget for neuroscience research, and the investment likely will result in wide-ranging research benefits. She presented several examples of scientific innovations that will help advance this initiative by improving our ability to understand complex brain processes, including the Brainbow, the Connectome, CLARITY, research in Zebra Fish Larvae, optical imaging technologies, and brain functional connectivity imaging at high magnetic fields. She also noted that the public will be given the opportunity to review and comment on progress and future directors for the Brain Initiative here.